Destruction and construction are two sides of a coin. These two eternal activities run in a circle across the world. Not only Hiroshima and Nagasaki proved to be phoenix but also New York City fought back with courage by reopening the train station below the twin towers of the World Trade Center at Manhattan, which were reduced to dust in the 9/11 terrorist attacks. The subway rail station beneath the World Trade Center was a vital transit connection between New York and New Jersey. The inauguration of a new train station restored the connection yesterday after 12 years of delayed construction.The same place which was destroyed in the 9/11 terrorist attacks came alive as the world’s costliest train station in New York City. Named the World Trade Center Transportation Hub, the new subway train station is a new ray of hope amidst the traumatic memories of what shook the US in 2001. It is expected to lessen the intensity of the trauma though scars of the wounds inflicted to the being of North America will remain. However, the world’s costliest train station in New York will link the PATH commuter rail line to New Jersey with the subway lines across New York. There is an indoor way for pedestrians to access the Trade Center from the new station building named Oculus. Architected by a Spanish-Swiss architect, the station building is an oval shaped giant structure of steel ribs and glass, with two wings like those of a bird spreading out towards the sky. The building will house an upscale shopping and restaurant plaza which will be unveiled in August this year. The interior of the world’s costliest train station in New York boasts a huge cathedral-like space which is soaked in natural light filtering through the glass walls at daytime. The bright beauty and innovative infrastructure of the station Oculus has silenced the critics who were vocal against a whopping increase in the budget from US$2 billion to US$3.8 billion over 7 years of delay in the construction. The World’s costliest train station in New York is partially opened without any official ceremony. 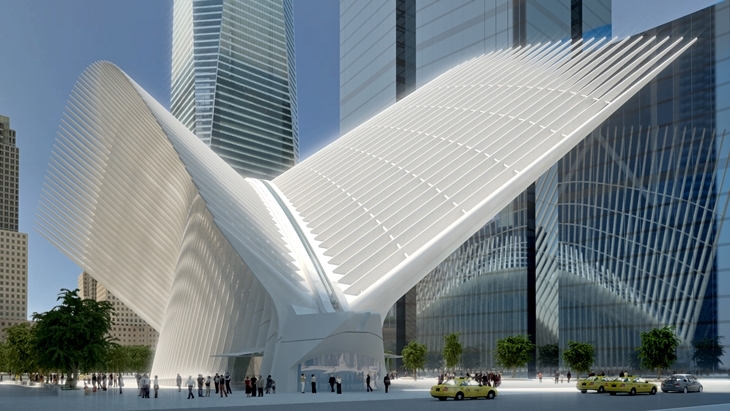 On completion, Oculus will be the third largest transportation center in New York City for more than daily 200,000 commuters. Travel on Cheap Flights from New York to Manila, Bangkok, Dubai, Singapore, Abu Dhabi, Hanoi, Doha, Beijing, Chiang Mai and other major cities on iEagle.com. The lowest airfare is guaranteed!